Chanteuse Rock 'n' Roll Australienne née Elizabeth (Betty) Rankin McQuade, le 26 Août 1941 à Paisley (Ecosse). Betty McQuade a émigré à l'age de huit ans avec sa famille en Australie. Elle est décédée le 26 Décembre 2011. 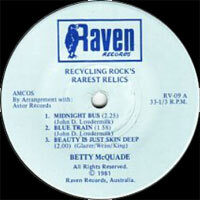 Betty McQuade is best remembered for her bluesy rendition of 'Midnight Bus' which reached No. 6 on the music charts in Melbourne in 1961. Born Elizabeth (Betty) Rankin McQuade in Paisley, Scotland on 26 August 1941, Betty's family migrated to Australia and settled in Brisbane when Betty was eight years old. As a teen she appeared in many talent contests and performed in various clubs and music venues around Brisbane including Festival Hall where she supported Johnny O'Keefe and Col Joye in 1956. In 1960 Betty moved to Melbourne in the hope of advancing her singing career and quickly found success as the new lead singer of The Thunderbirds replacing Judy Cannon. 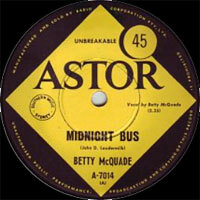 In 1961 Betty was signed to Astor Records as part of the company's new policy of signing and promoting local artists. The runaway success of 'Midnight Bus' led to television appearances on 'Six O'Clock Rock', Teen Scene', 'In Melbourne Tonight' and 'The Go!! 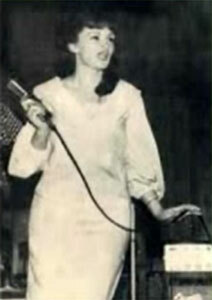 Show' and in 1962 she joined The Premiers who provided backing Vocalss for her fourth and last single with the Astor label, 'Bobby, Bobby, Bobby'. In 1965 Betty was signed by the Go!! 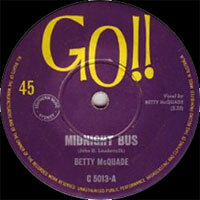 label which re-released 'Midnight Bus' and Betty's 2nd single, 'Blue Train'. 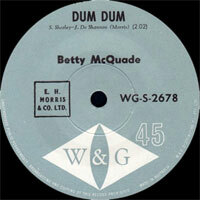 In 1966 Betty McQuade returned to Queensland where she continued to perform in local clubs. During the 1980s, a resurgence of interest in the first wave of Australian rock 'n' roll saw Betty performing at many rock 'n' roll reunion tours and concerts performing with The Thunderbirds, The Premiers and the Allstars. She continued to be a dynamic live perfomer well into the 2000s and was much admired by the music community until her death on 26 December 2011.